Budget: I don’t quite have all of the cards I have on this list, but I’d be willing to spend some money on this deck. In particular, I need to get the promo versions of Jace and Chandra so that they fit the deck’s theme, and that’ll set me back a reasonable amount of money. Playgroup: I no longer have a regular playgroup. I now play at a FLGS that has a wide variety of decks with little-to-no self-imposed restrictions. Things like very well tuned Azorius control decks can go up against Casual Mill or other, similarly lower-powered decks. The primary reason I realise that I'm a Timmy is that I love tribal. I just can't get enough of it and love to theme decks around it, even to the detriment of it (during INN/M13/RTR Standard I ran a BR Vampire tribal deck, despite the fact it didn't have a great deal of tribal support and that there were much more powerful decks available at the time). I've always known that I wanted to do a Zombie tribal EDH deck, or at least for over three four years – the first date I have on my files planning this deck out is the 15th of November 2013, just after Theros was released. Grimgrin, Corpse-Born and Thraximundar stood out as decent generals (even though, at the time, I didn't own a copy of either) but as soon as I saw Lord of Tresserhorn I knew that I had to run a zombie tribal deck with a Voltron sub-theme. A 4 CMC creature with a power of 10? Yes, please! His ETB ability isn't the nicest of things to have to deal with. Previous versions of the deck ran a suite of cards specifically to prevent it from being a problem, but in time I’ve come to terms with it and don’t really bother worrying too much about it. The deck now incorporates a fair amount of token generation and reanimation, so sacrificing two creatures isn’t too much of a problem. And if I don’t get my Commander out then I can still overrun my opponents with a zombie horde. As ever, I’m looking for feedback on this deck. It’s now in its second third incarnation, thanks to feedback from people both here and on Reddit. I feel that it’s a lot more balanced both in terms of Zombie Tribal vs. Voltron as well as in interaction with my opponents. I've uploaded the deck to TappedOut.net, and the deck list can be found here, in case anyone wanted to look at the deck in more detail or to playtest it. The deck can also be seen below, with in-depth discussion of my choices. That may get a bit tricky, seeing as a number of cards were chosen because they fit into multiple categories, but I’m going to have a go and explaining my choices. The big man himself who heads the deck. With any kind of Power boost he can kill any given opponent in two turns. His only real downside is the triggered ability printed on the card. So let's see what I can do about that. These five cards are the main ways that I can get around having to sacrifice two creatures. The first three generate two creatures when they and/or Lord of Tresserhorn are cast, meaning that I can potentially cast him the turn after I’ve cast any of them, as early as turn 4 in the case of casting Diregraf Colossus on turn 3. The latter two cards have a permanent way of bringing themselves back from the graveyard so are much easier to let go than any other creatures in the deck. Assuming I don’t sacrifice the Drunau Corpse Trawler to the Lord of Tresserhorn, he also allows me to give my Zombies Deathtouch. The Pyre Zombie self-regrows and can act as repeatable burn. The Vizier is a Zombie Clone, which gives me some versatility against people with better cards than me. I’m listing these cards together as a lot of the cards in one category also double as another. All of these are decent Zombie-related removal spells. Noxious Ghoul works especially well with some other spells in the deck that let me put a bunch of Zombies into play at once as it gets around Indestructible. Whilst Zombie Apocalypse is a very specific board wipe, in the late game it works much better as a mass reanimation spell for me, especially with Noxious Ghoul in play. Liliana is a star player in this deck as not only does she give me a one-sided board wipe but she also protects herself by creating on-tribe tokens and bringing back my creatures from my graveyard, too. All of these directly pump my Zombies, as well as the already mentioned Liliana’s Mastery. Most of them do other things, too, such as generating tokens/graveyard hate (Cemetery Reaper), giving extra keywords (Death Baron, Frightshroud Courier, Lord of the Accursed, and Zombie Master), a rattlesnake effect against board wipes (Diregraf Captain), a regrowth effect (Lord of the Undead), ramp through discounting spell costs (Undead Warchief), and card draw (Vanquisher’s Banner). Frightshroud Courier is especially good for the Voltron aspect as the Fear it grants can be a very effective evasion ability. Like Frightshroud Courier above, these cards make it harder for my opponents to block my Commander. Unlike the Courier, they make it more viable for my Zombie horde to overwhelm my opponents as they affect all of my creatures. The Zombie Trailblazer also gets a boost from Urborg, Tomb of Yawgmoth (mentioned later) as that means I don’t need to tap any Zombies to turn my opponents’ lands into Swamps. My philosophy on silver-bordered cards is that I intend to put a single one in each of my Commander decks, but have an alternative card that has a similar cost and function so that after January 15th if anyone has a problem with me including a silver-bordered card I can swap it out for a black-bordered card. In this deck, that card is Summon the Pack and the black-bordered “equivalent” is Army of the Damned. Both cards give me lots of Zombies, albeit in slightly different ways, at a similar enough cost. These two cards, along with the previously mentioned Diregraf Colossus, Drunau Corpse Trawler, Liliana's Mastery, Liliana, Cemetery Reaper, and Graf Harvest allow me to go somewhat wide with Zombie tokens, which will hopefully get pumped up through the various lords already talked about above. Unscythe also doubles as helping the Voltron strategy in the usual manner. I’ve got a number of on-theme card draw spells here, as well as the already-mentioned Vanquisher’s Banner. Whilst the Champion isn’t a Zombie, when I bring it back with Eternalize, drawing even more cards in the process (especially if I have any pump lords on the table already), it is. 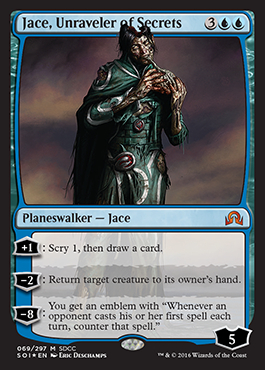 Jace and Chandra will be the SDCC16 versions, where they are Zombie versions of themselves. They’re not technically Zombie tribal, seeing as the word “Zombie” doesn’t appear anywhere on either of their cards, but I can’t pass up the opportunity to have literal Zombie Planeswalkers in this deck. Jace also doubles as spot removal with his bounce ability and Chandra as a board wipe with her –X ability. 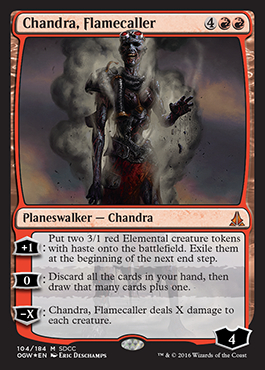 Chandra’s +1 ability can also generate two creatures to sacrifice to the Lord of Tresserhorn’s ETB ability (which is especially good seeing as they would be getting exiled in the end step anyway). Nothing terribly special here, though finding that there’s a Zombie mana dork was surprising and a worthy inclusion. The Nightscape Familiar is also fun, as it can affect multiple spells each turn (and not just Zombie Creature spells at that). I’ve got a handful of fairly standard cards for a Zombie deck here. The Lich and the Grotto along with Liliana, Zombie Apocalypse, and Lord of the Undead, as well as Cemetery Reaper and Graf Harvest, allow me to bring back my creatures from the graveyard (or exile them to get a token in the case of the latter two). The Lich can also cast opponents’ creatures from their graveyards, reanimating them under my control, and the Reaper can exile their creatures instead of mine for the token. Grave Betrayal turns all removal spells against my opponents’ creatures into theft spells for me. All of these cards are in the deck to help the Commander deal Commander damage, either through giving him Haste (so he can attack the turn he’s cast), evasion (to prevent him being blocked), and/or Trample (so that even if he gets blocked some of his high Power will Trample through to the player). The notable exception to this is Dragon Throne of Tarkir. I have the option of strapping the Lord of Tresserhorn into it to give all of my Zombies +10/+10 (or more) and Trample. It’s kind of a reverse-Voltron card that uses the Lord to give me an Overrun effect if I’ve gone especially wide with my Zombie horde. Nothing terrible special here, other than the Rooftop Storm which helps activate my backup win condition. These Zombies were chosen to fill out the deck specifically because they’re Blue and/or Red as well as having at least one generic mana in their casting cost so that Nightscape Familiar makes them cheaper to cast. The Lava Zombie along with the Rooftop Storm is my backup win condition. If I have Rooftop Storm in play along with Vanquisher’s Banner and/or Kindred Discovery in play then I can cast the Lava Zombie for 0 mana, return it to my hand, and draw a card. It lets me draw my entire deck. As soon as I’ve drawn Diregraf Colossus, I’ll cast it so that every time I cast Lava Zombie I get a free Zombie. Finally, once I’ve got enough Zombies in play I can sacrifice them to Grimgrin, Corpse-Born forcing opponents to lose life with Diregraf Captain and/or pinging them by removing the +1/+1 counters from Deathbringer Thoctar. It’s a roundabout way of doing it, but I only discovered it whilst playtesting the deck – it’s not actually a win condition I deliberately built into the deck. Again, nothing terribly special here. I chose 2-CMC mana rocks (and Sol Ring) specifically so that I can ramp on turn 2 to give me a chance at a turn 4 Lord of Tresserhorn is I have Diregraf Colossus in my opening hand. Also, Neheb, the Eternal is something of a misnomer here, giving ramp once you’re already at a fairly high mana total (having to have had to pay 5 to get him out to begin with) but considering that there are some expensive cards in the deck, that explosion of Red mana can really help out sometimes. Something I noticed when I was going through the deck was that I had no non-creature removal. Seeing as I was in Grixis, I figured I owed it to myself to include some Artifact-destruction spells in the deck. I specifically picked spells that had other uses, particularly creature removal, so that they wouldn’t just end up as dead cards in my hand. Fiery Confluence can also give me an explosive turn if I have Neheb, the Eternal in play as I could choose to do 6 damage to each player, earning me that much Red mana in my second main phase. Nothing terribly exciting here. In total there are 38 mana-producing lands (including those listed earlier in this list) which seems about right for this deck. So that’s where the deck is right now. I think that I’ve struck a fine balance between Voltron and Zombie-Tribal (mostly by counting the Zombie-pumping lords as counting as Voltron too), which is better than the last version of the deck. I still think that I could do with more Blue and Red cards in the deck, to make my colour ratio a lot more balanced, though it’s hard to see how I’m going to do that whilst still keeping the Zombie theme, seeing as most of the better Zombie cards aren’t in those two colours. There are plenty of cards that I’d like to put in the deck, but couldn’t find room for them. They include Mikaeus, the Unhallowed, Gravecrawler, Plague Belcher, Nim Deathmantle, Grave Titan, Deadapult, Endless Ranks of the Dead, Helldozer, Sidisi, Undead Vizier, and Corpse Harvester. I’m hoping that through playing the deck I can find weak cards and replace them with some of these. Last edited by Masked Thespian on 2017-Dec-25 8:23 am, edited 2 times in total. 26/05/17: Cards Removed: Agent of Erebos, Coat of Arms, Custodi Lich, Cut // Ribbons, Death Baron, Door of Destinies, Fireball, Graf Harvest, Gravespawn Sovereign, Lim-Dul the Necromancer, Lord of the Accursed, Nameless Inversion, Nantuko Husk, Nightscape Battlemage, Obelisk of Urd, Phyrexian Ghoul, Plaguebearer, Sol Ring, Soulless One, Time Stop, Tymaret, the Murder King, Undead Warchief, and Withered Wretch. 4 x Swamp. Cards Added: Aggravated Assault, Army of the Damned, Blood Mist, Blood Scrivener, Commander’s Sphere, Corpse Augur, Cryptbreaker, Deadapult, Diregraf Colossus, Distant Melody, Fervor, Inquisitor's Flail, Leyline of the Void, Psychic Possession, Ring of Evos Isle, Savage Beating, Summary Dismissal, Swiftfoot Boots, Sword of Feast and Famine, Sword of Vengeance, Temur Battle Rage, Unscythe, Killer of Kings, and Volcanic Rush. 1 x Mountain, 3 x Island. Budget: None set. Most , if not all, of these cards I already own. Playgroup: I no longer have a specific playgroup, instead playing at my local gaming store. As such I can expect to play any number of different decks, ranging from unmodified precons all the way up to a rather strong Grand Arbiter Augustin IV control deck. The primary reason I realise that I'm a Timmy is that I love tribal. I just can't get enough of it and love to theme decks around it, even to the detriment of it (during INN/M13/RTR Standard I ran a BR Vampire tribal deck, despite the fact it didn't have a great deal of tribal support). I've always known that I wanted to do a Zombie tribal EDH deck, or at least for over three years – the first date I have on my files planning this deck out is the 15th of November 2013, just after Theros was released. Grimgrin, Corpse-Born and Thraximundar stood out as decent generals (even though, at the time, I didn't own a copy of either) but as soon as I saw Lord of Tresserhorn I knew that I had to run a zombie tribal deck with a Voltron sub-theme. A 4 CMC creature with a power of 10? Yes, please! His ETB ability isn't the nicest of things to have to deal with, so something will have to be done to ameliorate it, but I'm pretty sure I can have some fun doing so. And, if not, then I can always overrun my opponents with a zombie horde. As ever, I’m looking for feedback on this deck. It’s currently in its second incarnation, thanks to feedback from people both here and on Reddit. It’s a lot more balanced (in terms of Zombie Tribal vs/ Voltron) but I’ve had to make a number of cuts I wasn’t particularly happy with. I suppose that’s my fault for trying to blend two different archetypes in the same deck. The big man himself. With any kind of Power boost he can kill any given opponent in two turns. His only real downside is the triggered ability printed on the card. So let's see what I can do about that. The first 6 cards are the main ways this deck can deal with his ETB ability. Each of these can either counter the ability or can end the turn (and exile the ability whilst it's on the stack). There aren’t many other things they’re good for, though they do allow me some interaction with things on the stack and preventing other players’ ETB effects. I could have possibly also included Quicken and Day’s Undoing but I figured that needing two specific cards in hand to cast my Commander would be too tricky to pull off. I also used to have Time Stop but needing 10 mana just to cast my Commander for the first time seemed a little excessive. The latter two cards are actually ways to allow me to cast the Commander in spite of his ETB trigger. The Diregraf Colossus, if cast on turn 3, allows me to cast Lord of Tresserhorn on turn 4 without too much pain (as the cast trigger gives me a second creature to sacrifice to his ETB ability). Psychic Possession can be cast on any given Blue player to give me extra card draws, but if I then cast my Commander and target that player with the “draw 2 cards” part of his ETB trigger then I’m actually drawing cards off of it too. I have a variety of cards here that pump my Commander, spread out over various different card types. I have ways to increase his Power, ways to give him Double Strike, Haste, Trample, and Hexproof, and ways to double the damage he deals. Of particular note is the combination of Aggravated Assault with Sword of Feast and Famine: together they effectively give me infinite combat steps as long as he keeps connecting with an opponent. Volcanic Rush was chosen to give my entire team a boost, giving me the flexibility to use it with a horde of Zombies instead if necessary. Originally, this deck was going to include the traditional Mike/Trike combo, but as I was putting this particular deck list together I decided that I didn’t want to just put a 2-card combo in the deck. There are multiple combos in the deck that can win the game for me on the spot, but all of them require three or more cards. Ashnod’s Altar + Diregraf Colossus + Gravecrawler + Rooftop Storm = Infinite Zombie tokens. As is appropriate for a tribal Zombie deck, there are a number of cards that will boost the other Zombies in the deck. All of these pump up my Zombie creatures (including my Commander). Liliana’s Mastery is a little more difficult to deal with than the other two, and also comes with two bodies. The other two give me Graveyard hate and recursion, making them a little more valuable than any other possible Lords for the deck. I had to cut a lot of cards from this category, as I previously had 11 Lords. I do wonder if I’ve gone too far in cutting them, seeing as they pump up my Commander, but something had to go in order to make room for the Voltron aspect of the deck. Graveborn Muse is one of the few sources of card draw in the deck, the Lich Lord gives me Zombie tokens as well as an alternative way to attack my opponents, the Vizier is a Zombie Clone (at least when I Embalm him), and the other four cards are pretty much a given for a Zombie Tribal deck. The Helldozer gives me a form of land destruction and the Noxious Ghoul gives me a nice way to deal with creatures with Hexproof or Shroud. Scour from Existence is there as Enchantment removal, to deal with things I can’t otherwise handle. The Leyline gives me some one-sided Graveyard hate that is quite effective whilst still allowing access to my own Graveyard. Sidisi gives me a general tutor for whatever card I need, whilst Corpse Harvester acts as pseudo-ramp as well as getting me any Zombie in the deck. The other two give me some landcycling, in case I need to trade them in for a land. Liliana is, of course, probably the most appropriate Planeswalker for this deck, seeing as the word ‘Zombie’ appears in each of her abilities. Jace and Chandra will be the SDCC16 versions, where they are Zombie versions of themselves. Their abilities don’t particularly fit in well with the deck, but I can’t pass up the opportunity to have literal Zombie Planeswalkers in here. This was one of the places where the first version of this deck had problems, as I often emptied out my hand but had no way to refill it in playtesting. Blood Scrivener, Corpse Augur, and Cryptbreaker are all Zombies that let me draw, as Distant Melody is good as long as I have a couple of Zombies on the board. Skullclamp combos with Gravecrawler, allowing me to pay 1B on my turn (as long as I have another Zombie in play) to draw 2 cards, as many times as I like. Unstable Obelisk doubles as another piece of Enchantment removal, whilst Commander’s Sphere and Chromatic Lantern are there to ramp me up, especially with coloured mana as that can be a problem with the deck. Phyrexian Tower gives me an additional sac outlet, albeit only once per turn. The Mutavault acts as another Zombie, and with enough Lords in play could get pumped up to some quite impressive Power and Toughness numbers. Rogue’s Passage allows me to slip my Commander past my opponents’ defences whilst Unholy Grotto is pretty much an essential part of any Zombie Tribal deck (especially with the Nameless Inversion, as mentioned above). Bojuka Bog gives me some more Graveyard hate whilst Cabal Coffers and Urborg give me the chance to ramp me up. Everything else just happens to be the multicolour lands I have to hand. I don’t have enough of the newer dual lands to use them in this deck, though I’d like to, especially Sunken Hollow/Smoldering Marsh and possibly Fetid Pools/Canyon Slough as they can be Fetched. So that’s where the deck is right now. I’m much happier with the Voltron side of the deck (as it was practically non-existent in the first draft of the deck) though I’m not too happy at the number of Zombie Tribal cards I’ve had to drop to make room for them. I think that I could do with more Blue and Red cards in the deck, to make my colour ratio a lot more balanced, though it’s hard to see how I’m going to do that whilst still keeping the Zombie and Voltron theme. At least most of the Voltron cards I added were Red so helped push that side of the deck up a bit. I’m debating dropping the Chromatic Lantern and the Commander’s Sphere for 2-CMC mana rocks that still give me multiple colours of mana, such as Talisman of Dominance/Talisman of Indulgence, Corrupted Grafstone, and/or Dimir Signet/Rakdos Signet, since my goldfishing sometimes shows that I can have a difficult time getting up to 3 mana. I could possibly do with a few more mana rocks as the deck doesn’t have a lot of ways to ramp otherwise, but it’s making room for them that’s the biggest problem. Last edited by Masked Thespian on 2017-Dec-25 8:14 am, edited 2 times in total. Some really powerful effects for this deck would be double strike, double damage, extra combat phases, and extra turns. This coupled with haste makes your commander a one turn kill threat. Basically any zombie lord that doesnt provide card advantage. Agreed. In an ideal world that's what I'd like to do. I'm just concerned that I don't have enough room to do that whilst still having a decent Zombie theme that I can fall back on if the Voltron thing doesn't work out (which will likely happen more often than not). This I'm not a fan of simply because it isn't a Zombie. Whilst I am willing to break theme for certain reasons, extra combat steps are available on other cards (mostly ones that you've pointed out) so I don't think I can justify putting it in the deck. All of these are perfect for the style of deck I want to play, though I'm a little iffy on Breath of Fury (just because it's an Aura that requires the creature to connect with a player). I will certainly take them under advisement. Ehh... Not a fan of extra turn effects. I'll keep them in mind, though. Again, whilst these do provide me with much-needed card draw, I don't think I want to break theme for them. Especially the goodstuff Sphinx. I'm giving some thought to adding Blood Scrivener, Corpse Augur, Cryptbreaker, Necromancer's Stockpile, and/or Distant Melody to the deck to give me some Tribal card draw. I'm not a fan of Psychic Possession in this deck, as it would require me to identify the player who will be drawing the most cards in advance of playing. Mind's Eye seems quite expensive, but does seem like a good card, since it triggers off of every card draw, including the usual one per turn. You know, I can't make my mind up over Tainted Strike. When I started writing out this deck list, I told myself that I wasn't going to include Tainted Strike. It seemed like a cheap way to win and not very full of value, since you can't reuse it without some work (unlike Enchantments or Equipment). However, I now can't help but think that it makes a whole load of sense, in a Vorthos kind of way. Assuming a Resident Evil-style of Zombie, it makes sense that a single bite from the lord of the Zombies would infect you and turn you into one (aka killing you). And if you save it for the final opponent then there's not much of a need to find ways to reuse it. I don't think I'd include any of the other Infect cards, though, as Infect tends to have a very polarising effect on the casual players I'll mostly be playing against. Whilst I'm not a fan of the Axe (since it's not very splashy), but the Sword does seem like a very good include alongside Aggravated Assault. Summary Dismissal is a great card that I'd missed in my first draft and I'll definitely have to include it. I'm not 100% on the Leyline. Whilst it does shut down my opponents' Graveyard strategies, some of my strategies include preying on their Graveyards. However, I think you may be correct that I ought to include it rather than not. Whilst I'm not saying that your suggestions here are bad ones, I can't say that I'm fond of them. Without Ribbons and Fireball, that leaves me with nothing to do with the infinite mana from the latter two combos, which seems like a waste to me. I will say that they are only in the deck to do something with that mana, but Cut does at least give me a removal spell and Fireball can also be used as removal if necessary. Obelisk, Coat, and Door are all Tribal staples so I really can't see cutting them. Whilst I will admit that Time Stop is the most expensive way to prevent the Lord's ETB trigger from happening, it also provides some measure of protection against other combo decks, or even just getting overrun by creatures, so it does have some defensive capabilities. Having said that, with your suggestion of Summary Dismissal, I may very well cut it for that. I also can't see myself cutting the lords, even the ones that don't provide card advantage, because again, they are for the Tribal aspect of the deck and I'm worried that if I go too light on them then the deck won't work well when I'm mid-game and pushing the Zombie strategy over the Voltron strategy. They also pump the Commander, which does help him. Thank you very much for the response. I'll certainly take some time to think about your suggestions, even the ones that I've said that I'm not fond of here. right but even if you devote just 5-10 slots into your deck it would improve the voltron theme without overthrowing the zombie theme. So a few surprise cards that one shot your opponent keep them on their toes the whole game. Plus it seems that this deck has a combo zombie theme first, then voltron second. I think the beat face with zombies is the least likely way you are going to win a game. both these cards allow you to draw cards when you play your commander. Just stick psychic possession on any blue player and get free draws from them. Maybe it's just me, but I think this card is grossly underrated. Thanks for the advice. I’ve taken some of it on board and changed the deck, incorporating a number of your ideas into it. You can see the new deck list in the first post and the reasoning for some of the changes there too. After a long period of time, I've rewritten the deck from the ground up. In particular, I've done away with the idea of having multiple deliberate combos in the deck and built it with a lot more emphasis on Zombie-Tribal cards that pump the Lord of Tresserhorn in place of Voltron effects.